Palestine has a new cinema, making, I think, three in all in the West Bank. 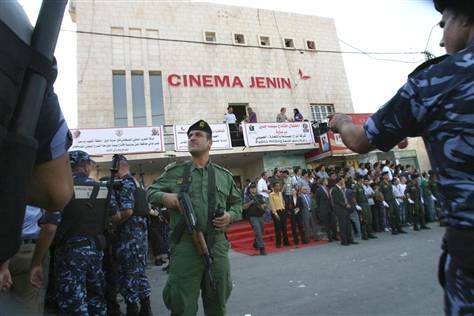 The cinema in Jenin, in the Northern part of the West Bank has been re-opened after more than 20 years. It closed after the first Intifada in 1987. The re-opening last week was widely reported (see the various Google listings here) and the full background to the campaign leading to the re-opening can be downloaded here. The majority of the money needed has come from a German governmental source following the participation of the documentary filmmaker Marcus Vetter, who joined local campaigner Ismael Khatib. Vetter made the documentary Heart of Jenin about Khatib’s decision to donate his child’s organs after Israeli soldiers shot dead the 12 year-old boy carrying a toy gun. Equipment suppliers offered various goods and services ‘in kind’ and there were substantial private donations led by Roger Waters of Pink Floyd fame. Unlike the previous opening of a new cinema in Nablus last year, which is a mainly commercial venture, the Jenin project stresses community activities and a range of cultural programming. Palestine urgently needs both kinds of venture and it’s great to see this happening. It’s also interesting to see how the story has been reported – the cinema is reported to have 300, 350 or 400 seats depending on which report you read. But all agree that there are a range of facilities available, including an outdoor screening facility. More controversially, there does seem to be some local disquiet that the re-opening symbolises a possible ‘normalisation’ of relations with the Israeli occupation, especially if Israeli films will be shown (albeit ones which focus on the Arab experience in occupied Palestine). A report in the Lebanese Daily Star also suggests that the new operation will respect local concerns and that screenings may be offered for women only in a programme of ‘quality films’. Making films in Palestine isn’t easy for a whole range of reasons – not least because most young Palestinians have never even seen a film in a cinema and antipathy to any venture that requires tacit Israeli approval (i.e. allowing equipment and personnel into the West Bank and Gaza) is understandable. It is amazing therefore that Palestinian film culture flourishes at all. I hope that the new cinema prompts more local participation. 1. No constructive cultural activity will take place here for that entails resistance to occupation. If it does, I’m not sure how long the cinema will survive. 2. 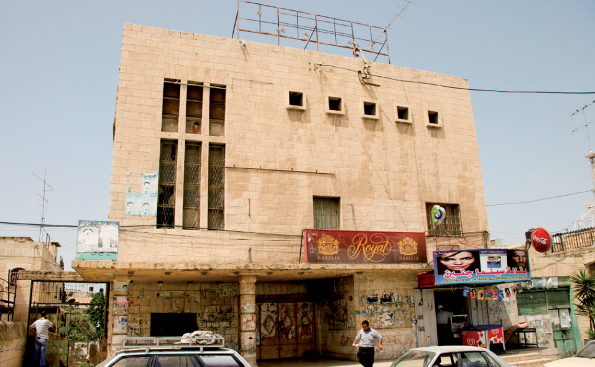 The construction of the cinema, as you say, seems more like a pacifier – sort of a first step in Palestinian complacence. 3. Plainly, there might not be any difference between this cinema and the slew of MacDonalds outlets across the third world. Culture and Army go hand in hand. But it’ll be interesting to see what happens. I guess you are right to be cautious re your first point. On the second, I am only reporting what other media outlets have said about how the re-opening has been received. I think I must take issue with your third point though. Palestine is a special case in many ways – there are so many outside agencies interested in funding cultural activity that in some ways a more ‘art’ orientated film culture is always likely to be present. Most Palestinian films come from exiled filmmakers supported by European funding. Palestinian audiences are in one sense like audiences everywhere, wanting entertainment, but they are also well-educated and politicised by comparison with many other countries. But I suspect that Jenin may be a rather different community than Nablus or Ramallah (where cultural activity is more pronounced). Of course, nothing like this cinema re-opening is happening in Gaza where life is even tougher.